The leading training service provider of first aid, cardiopulmonary resuscitation (CPR), and automated external defibrillation (AED) in the Saskatoon area is Saskatoon First Aid. All classes are St Mark James certification courses overseen by St Mark James certified instructors. Instructors are friendly, welcoming, knowledgeable and professional. Instructors are taught to teach using a variety of techniques to ensure you get the most comprehensive training available. Enrolment can be completed using the on-line application form below or through e-mail, telephone call, or walk-ins at the training centers. Stand-alone, private, and refresher classes are also offered with this St Mark James training provider. 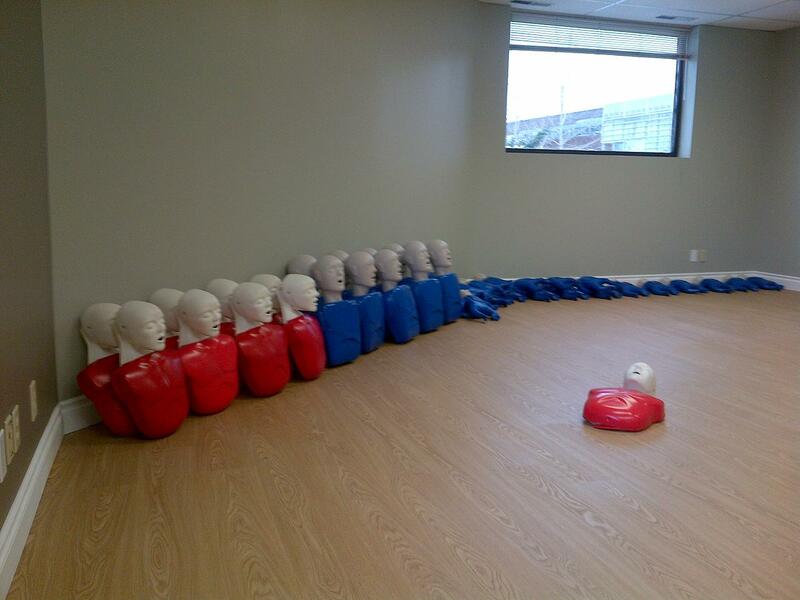 The most popular course in Saskatoon is standard first aid, CPR and AED because it is the only basic first aid course that meets provincial regulations in Saskatchewan. CPR certification is mandatory with the course and participants may select the level of CPR to partner with the course. Available level’s of CPR include “A”, “C” and “HCP”. Contact your employer or school to determine which level of training is right for you. Re-certification classes are available for individuals that hold current certificates. This course takes a minimum of 18 hours to complete and is typically completed within two days. To register for this course use the contact form provided on the bottom of the page. The Saskatoon First Aid website has the complete list of offered courses and schedules. There are three levels for CPR and AED training. Level A and C are for first time trainees while HCP is for health care providers or professionals. All levels include CPR and AED training for adult victims. AEDs are machines able to detect heart rhythms and apply needed shock to restart the heart. Because of the recent updates in providing CPR and AED, only the latest Basic Life Support (BLS) guidelines by the American Heart Association are taught to the trainees. One of the updates can be seen below. Do a scene survey by checking for hazards. Have a bystander call for medical help as soon as you recognize the unresponsiveness of the victim. Do a secondary survey if necessary and provide CPR and first aid if applicable. Turn the patient into the recovery position if injuries allow you to do so. Loosen any tight fighting clothing around the neck, chest, and waist to allow for a good supply of fresh air. Treat for shock and keep the victim as comfortable as possible until he or she returns to consciousness. When the victim returns to consciousness, keep them lying down for 10 to 15 minutes if possible. Private classes are offered to big groups or classes who request a separate class and schedule. Training course rates are the cheapest in Saskatoon. Rates are inclusive of taxes, certificates, St Mark James registration fees, and training manuals and equipment. Full refunds are given to trainees who provide a 72-hour notice prior to dropping out. A standard first aid course in Saskatoon is — which includes taxes, certification fee’s and a take home manual. Trainees who complete a training course will be awarded a St Mark James certificate for first aid, CPR, and AED, valid for three years throughout Canada. Saskatoon First Aid offers refresher / re-certification courses for renewal of expiring standard first aid certificates at least twice a week. To complete your enrolment, fill out the application form below or send an e-mail at [email protected].